YES! 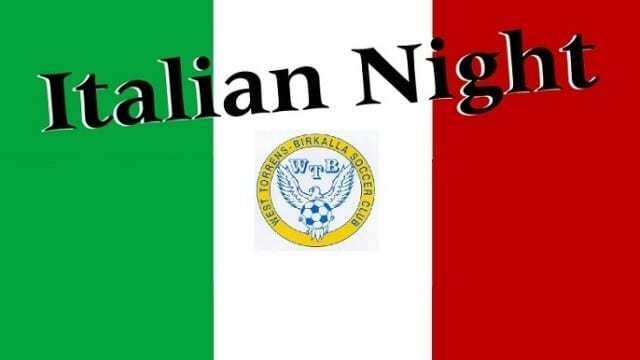 It’s that time of year we would like to welcome you all to WT Birkalla OPEN SEASON launch, this is to celebrate the start of the 2016 season, we would like your company in enjoying Italian night proudly provided and supported by Pat Giuliani from Australian Water Purifier systems and his band to kick off the night as well as Cooper Australia, Schweppes Australia & Royce Chocolate. 2015 was big! 2016 will be bigger. Cost: Adults $18, Kids $8 (Includes all food and live entertainment. It will be a family fun with 3 to 4 course of food (always a surprise) for $18 for Club Members not to mention to mingle with other sponsors & club people. We will present to our Seniors their player top from Macron for 2016; it will be a great opportunity to wish them well for the season ahead. Get in early so you dont miss out!